A man found guilty of manslaughter for selling toxic slimming pills that killed a student is set to appeal against his sentence. Eloise Parry, 21, from Shrewsbury, took eight tablets containing dinitrophenol (DNP) after buying them online from Bernard Rebelo. The 31-year-old, from Gosport, is due to appeal against his seven-year jail sentence at a hearing on Wednesday. Miss Parry's mother, Fiona, said it would feel "like going over it again". Following Rebelo's sentencing, Mrs Parry told the BBC she felt her daughter "has had some justice." But ahead of the Appeal Court date, she said: "We were feeling like, yes it is done, it is finished, then to know it wasn't finished... you would really like to be able to move on but when you are coming back for an appeal, it is like going over it again." Weight loss drug DNP is a highly toxic substance when ingested and burns fat and carbohydrates. 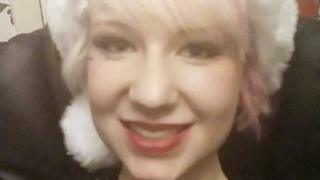 Miss Parry, a student at Wrexham Glyndwr University, had bulimia and borderline personality disorder. Image caption Fiona Parry said the appeal makes her family feel they are "going over it again"
Rebelo's trial heard she quickly became addicted to the pills and died at the Royal Shrewsbury Hospital in April 2015, less than three months after she started taking them. He was found guilty of two counts of manslaughter and placing unsafe food on the market. Although he had denied the charges, Rebelo admitted during the trial he sold the pills to Miss Parry, but said there was a warning about the drug on his website.